It is a truth universally acknowledged that the Victorians invented Christmas. Well; one Victorian in particular, by the name of Charles Dickens. But where did they stand on the next red letter day on the calendar, the one that pops up after boozeless, carbless, joyless January, to remind us that our hearts still beat warmly under all those jumpers? Valentine’s Day, originally the feast day of a Roman martyr, began to gain traction way before Victorian times. It became associated with courtly love in the circle of Geoffrey Chaucer in the 14th century, but it wasn’t until the 18th century that the feast day became associated with romantic love and the exchange of tokens between loved-up couples. These included hand-written cards known as ‘Valentines’. The Victorians seized on this tradition, mass producing Valentine’s cards. Hundreds of examples exist of syrupy, sickly-sweet designs featuring – as you might expect – kittens, cupids, lovesick shepherdesses and the like. 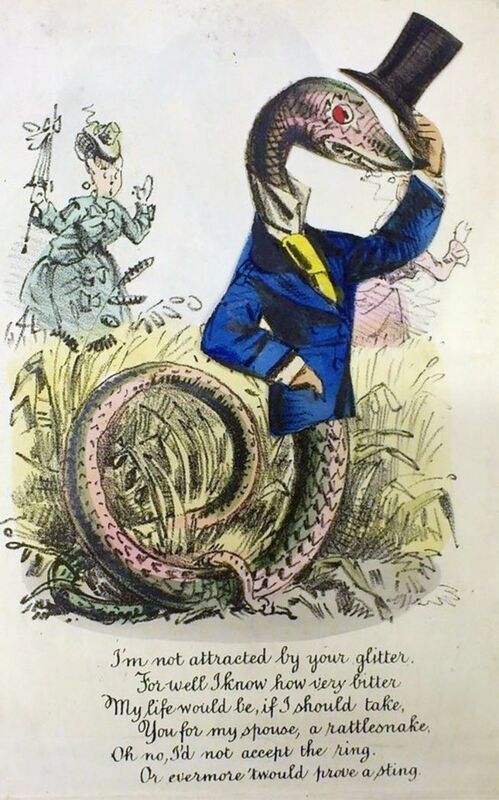 But what you might not have expected are the poisonous missives, known as ‘Vinegar Valentines’ that were also mass-produced to be sent to singletons. These cards featured grotesque illustrations accompanied by nasty little verses especially tailored to point out the recipient’s failings. As if it wasn’t bad enough to be blanked by Cupid, Victorian spinsters and bachelors could expect a Vinegar Valentine to land on the doormat on February 14th. Oh no, I’d not accept a ring. It’s no more, no less than early, analogue trolling. The Victorian era was one of contrasts. Buttoned up morality marched alongside widespread prostitution, burgeoning industrial wealth with abject poverty, It’s interesting to know that this dichotomy applied to Valentine’s Day too. Marina Fiorato’s latest novel Crimson and Bone, is out now in paperback and ebook. Marina Fiorato is the author of Crimson and Bone, out now in paperback.